Hi, welcome back to the last day of Intros. Release is tonight! Stampede tomorrow! 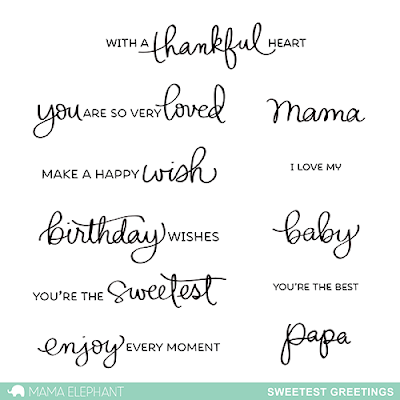 Today we're looking at Sweetest Greeting, a set I penned. I really wanted to do a larger basic sentiment that can cover the width of a card to make a nice statement. Sweetest Greeting features my script handwriting paired with a fun font. This set covers a good variety of occasions. I created a trio of cards using the largest frame from the newest set in the Framed Tags collection. This one is called Chelsea. The large scallop frame is just gorgeous with the pierce detailing, hence the feminine name of Chelsea. I had painted and cut too many of the cuties from Summer Days, so I made use of them here. I blended the backgrounds, did my water splattering thing and die cut them with the Chelsea frame. You can easily mass produce these, the sentiments from Sweetest Greetings really tops it off. I'll say it again, I really like the larger size, it makes just as much of a statement as the images! Love the Mama and Papa inclusion. Lovely font on these awesome sentiments. And the cards are so precious! Your handwriting is the best! I really hope you make some more sentiment sets with it featured! another great add to my collection. Absolutely love this set!! Your handwriting is so lovely.